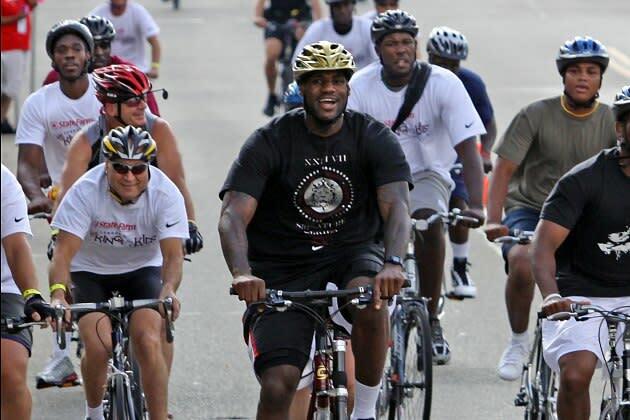 Way back in January 2012, when LeBron James was still a big loser who would never prove himself as a winning winner who wins, we published a photo of him biking to a Heat home game. It was a little weird, though only really because James was and remains a globally recognized superstar. Riding a bike is a perfectly reasonable way to travel. At some point this season, he occasionally began riding his bicycle to practice instead of driving. Then it turned into riding to morning shootarounds. James introduced his passion for riding when he was spotted on his bike on the way to the Heat’s game against the Chicago Bulls last January. Fatigue had little effect, with James scoring 35 points in a 97-93 victory. He has since added it into his conditioning program. The result has him averaging 37.6 minutes, topping 40 nine times this season. LeBron James is the most amazing physical specimen in the history of basketball, so it may seem a little odd that a little bit of biking every day would keep him in better shape. Something like, say, playing NBA basketball would seem to do more to keep him healthy. Plus, the stats show that LeBron's current 37.8-minute average tops only two seasons in his career, one of which is within 0.3 minutes of this mark. James is getting older, but it's not as if his body's breaking down. His minutes total is perfectly in line with what he's done before. Nevertheless, he deserves attention for biking, if only because it's good for the environment. While LeBron's carbon footprint is likely huge — particularly when you consider his indirect connection to Nike factories and the fact that he travels via private plane fairly often — he's also in a unique position to bring attention to more eco-friendly travel options like biking. He is not heroic, and I'm not even sure he's making this kind of statement on purpose. But every little bit helps.